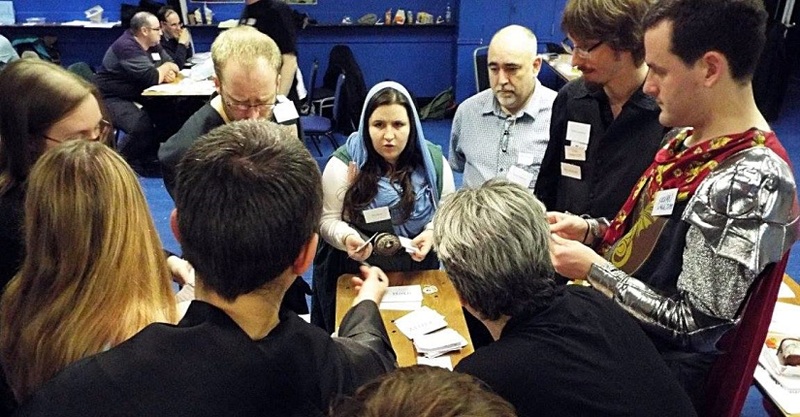 So it’s about 7 weeks until Everybody Dies Harder, the second run of my Game of Thrones themed Megagame. In the first run, one of the areas which was pretty under-developed was the Religion Game. My Control did a incred job of giving those players things to do throughout the day. But their game was less awesome than I’d have liked. So for the next run, I’ve added in some new rules. Fingers crossed, they’ll make the game a lot more interesting for the septas, septons, red priests, drowned priests, and all the other characters too. I’ve played a number of games with religion in. In some, religion is a minor influencer. E.g. in “Renaissance and Reformation”, set in 16th Century Europe, the key religions were ranked alongside the teams on the Prestige and Power trackers. In some games, religion is more of a driving force. In Come To A King, the bishops assembled for councils to determine laws that affected other players, such as succession to the throne. There’s one big complications when integrating religion into a game. It’s the gap between the modern and historical perceptions of religion. Nowadays, many people don’t follow a religion at all, and a those that do don’t adhere strictly. But in many game settings, religion played a much bigger part in life. Encouraging players to take a realistic approach to their character’s religion is challenging. Religion is a big thing in Westeros (as anyone who has watched the last couple of seasons of GoT will know). Their biggest religion is the Faith of the Seven (also known as the New Gods). The Faith plays a similar role to that of the Catholic Church during medieval times. It’s a similar style of worship, with holy books and a formal place of worship, the sept. It also places restrictions on various aspects of behaviour (gambling, bastardy, homosexuality) that reflect restrictions in existing religions. However, there’s one big difference to Europe during the Middle Ages. Other religions are permitted within the country of Westeros, with no attempt to curtail their activities or to encourage the increase in worship of the Faith. In the North, the Old Gods are worshipped almost exclusively. This is a much more pagan-style religion, predating the Faith. It has no holy books or priests, and the shrines of worship are weirwood glades. Meanwhile, on the Iron Islands, no one can stay there long enough to convert anyone away from the Drowned God. This sea deity predates the Faith as well, and seems engineered to endorse the ironborn’s harsh traditions of reaving and raiding. These three religions co-exist, with none trying to convert the others in recent years. Elsewhere in the world, other religions are bountiful: the Many-Faced God, the Lady of Spears, the Great Shepherd. The only other one that seems to influence Westeros is the Lord of Light. In the show, a main character (and claimant to the throne) has converted to this fire religion. It’s even more like Christianity than the Faith, with a belief in a One True God who is the only route to salvation, and a strong calling to convert non-believers. Since the Old Gods have no priests, there was no dedicated Old Gods player in the North. Meanwhile, every other region had a religious player. These were mostly septas/septons, who were responsible for promoting the Faith. The head was the High Septa, who sat on the King’s Small Council. The Iron Islands religious player was a Drowned Priest. He spent most of the game drowning people and endorsing whatever the Iron Islanders did. Additionally, there was one Red Priest (two by the end of the game). Their role was to convert players to the new religion (with a few specific high profile targets). This player did an amazing job. He was such a threat, he was eventually trampled to death. But he didn’t die! He was given two wounded stickers (you were supposed to only get wounded once, and, if you didn’t heal, die on the second wound). Naturally, everyone thought he was unkillable. He wasn’t. I would totally have killed him the next time someone even tried. To get a good idea of what actually happened in the first run’s religion game, I’d suggest taking a look at this AAR by the Septon of the Vale. The big mistake I made was to make this part of the game too dependent on roleplay. The Faith had aims such as advocating for the smallfolk and ensuring religion stays top of mind for players. Even for experienced megagamers, it’s possible these goals were too vague. They had some more concrete goals. Septons could advocate for building (expensive) new septs. They even had the unlikely target of trying to convert the Iron Islanders. The bad news was, these goals were near impossible to achieve. I’d made the decision to add the High Septa character to the Small Council. From the sounds of it, she had an entertaining game keeping the King away from the Red Priests. The High Septa also called a couple of Assemblies of the Faith players to discuss various issues around the realm. There was a religion value track, which ranked each of the four religions by dedication to them. Unfortunately, the game was so busy that the value tracks didn’t get updated very often. The local value tracks, on which players were ranked on the different values (including religion) worked a bit better. One of the eleven new roles I’m adding in is a second Red Priest. The first Red Priest did such an epic job, two Red Priests can only be double the awesome. In the game, Dorne is the “religiously tolerant region”. But the only religions that were competing in any meaningful way were the Faith and the Lord of Light, and the Lord of Light is a pretty polarising religion. In Everybody Dies Harder, I’m adding in the Mother Rhoyne religion, which is another somewhat pagan religion based on worshipping the river. At least one Dornish player will be following this new religion. A dedicated control member will be responsible for updating the value tracks. There wasn’t an Old Gods handbook last game (since there were no Old Gods players), but this time I’m going to give a copy to everyone in the North. Once per year (every four turns), Faith players will formally meet for an Assembly. There are some rules in their handbook that mean they don’t have to abide by the Movement Restrictions to attend. Last game, it was only possible to build single (expensive) sept. In Everybody Dies Harder, all regions (except the Iron Islands) will start with a sept. Players can pay to upgrade their sept. The Sept Level will affect what Gifts of the Faith are available to them. Each of the Seven Gods will give a different special ability. Faith players will be able to use one of these Gifts each turn. I won’t go into detail about what these are, but if you want the really awesome powers, you’ll need to upgrade your sept. The religion game in the first run was far from perfect. Players and Control gave me tons of useful advice, and I’ve put a lot of thought into making the next run better. Everybody Dies Harder is on 22nd April at St Thomas Centre in Manchester. We are currently full but have a waiting list in case of drop outs. If you’re interested, sign up here.